Sunny and Stormy Day! (Book and Game combo - Peaceable Kingdom Press- 2017) - On shelves at Target!! My daughter and I got to see the storybook/game I illustrated for Peaceable Kingdom Press, called 'Sunny and Stormy Day!' on the shelves at our local Target. Such a thrill!! Tags childrens book, game, childrens game, memory match, illustrator, illustration, children's book illustrator, target, target exclusive, on the shelves now! MY CHILDREN'S BOOK - 'You're My Boo' is in the Scholastic Book Club Flyer! Oh my goodness! 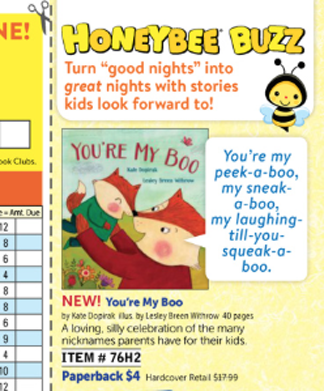 My children's book, 'You're My Boo' (Beach Lane Books/imprint of Simon & Schuster) Sept 2016 written by: Kate Dopirak and illustrated by: (ME) Lesley Breen Withrow is in the October 2017 Scholastic Book Club - Honeybee (for preschoolers) flyer! This is a total dream come true for me. I absolutely loved the Scholastic Reading Flyers when I was a kid. I can still remember the excitement I felt when the teacher passed them out and the thrill I had when my books arrived. I am honored to have a book that I illustrated be included into the Scholastic Flyer family. ...and to think that I can make a child feel that thrill makes me so happy. Tags scholastic book club, scholastic book club flyer, flyer, honeybee, honeybee October 2017, Children's books, illustrator, artist, children's book illustrator, kate dopirak, life of an artist! Was fun to receive my latest postcard in the mail the other day. My agent is sending them out to lots of publishers. Yeti the fun begin!! Happy One Year Anniversary to 'You're My Boo' - Beach Lane Books (an imprint of Simon & Schuster) September 2016. It was such a thrill to illustrate this book and I just love the trailer Kate and I had made for it... so I thought I's share it again. Enjoy! YOU'RE MY BOO by Kate Dopirak, illustrated by Lesley Breen Withrow Age Range: 3 - 5 A day in the life of a family is more than the sum of its adorable parts. "You're my peek-a-boo, my sneak-a-boo, / my laughing till-you-squeak-a-boo." So begins this mother fox's celebration of her quick, sneaky, funny, naughty little fox cub. 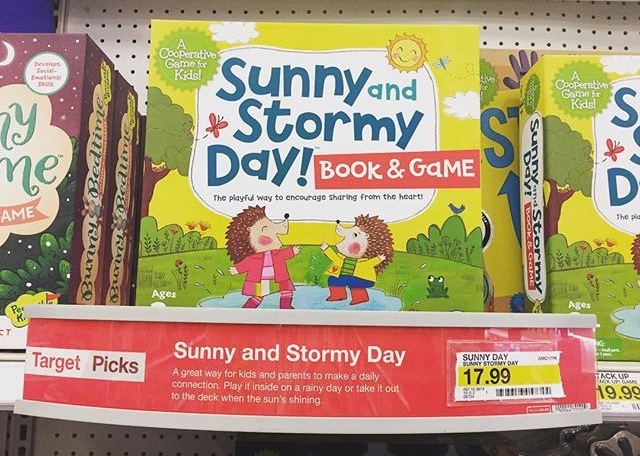 Sunny and Stormy Day - Target Pick! Sunny and Stormy Day! was a 'Target Pick'. So exciting. I was thrilled to work with one of my all time favorites, Peaceable Kingdom, on this storybook game project called Sunny and Stormy Day. And much to my surprise it was selected to be a and exclusive at Target! Woo Hoo!! My Big Box of Books Arrived!! A big box filled with the children's book I illustrated, called 'You're My Boo', recently arrived from Simon & Schuster! Such an exciting day... it's so fun to see your 'real' book. To feel the hardcover and binding and jacket and feel the turning of the pages. Love it! So, so exciting and a dream come true. You're My Boo - Awesome Kirkus Review! A day in the life of a family is more than the sum of its adorable parts. “You’re my peek-a-boo, my sneak-a-boo, / my laughing till-you-squeak-a-boo.” So begins this mother fox’s celebration of her quick, sneaky, funny, naughty little fox cub. All day long, the toddler plays, alternating between engaging its baby sibling and teasing it. And all day long, the mother cajoles, comforts, or corrects the child’s behavior, using the “boo” diminutive throughout, until at day’s end the child is comforted and tucked in to sleep. Adult readers with a low saccharine tolerance may shudder at the sweetness of the endeavor, but with its meticulous scansion and playful affection, it subtly morphs into a story that is both a silly name litany (always popular with young readers) and a quietly reassuring statement of continual mischief-proof parental love (“And no matter what you do… / you will always be my boo”). The book also draws a fairly neat line between the “boo” of “peek-a-boo” and the contemporary, affectionate slang term for “sweetheart.” Withrow’s accompanying pencil, collage, and digital art aptly illuminates the cub’s day, excelling in vignettes that illustrate the protagonist’s shenanigans even as the text delivers simple, one-word descriptions. In the end, it’s the love between parent and child that carries the story. Was Happy to see the gift bag I illustrated at Barnes & Noble! Hi there! My name is Lesley Breen Withrow and I am an artist and illustrator whose work can been seen on many products including children's books, stationery items, children's apps and toys. I am the illustrator of 'You're My Boo' - Beach Lane Books (imprint of Simon & Schuster) Sept 2016. 'Bunny Bus' - Farrar Straus Giroux, January 2017. Maximillian Villainous - Running Press Kids (imprint Hachette Book Group) August 2018.